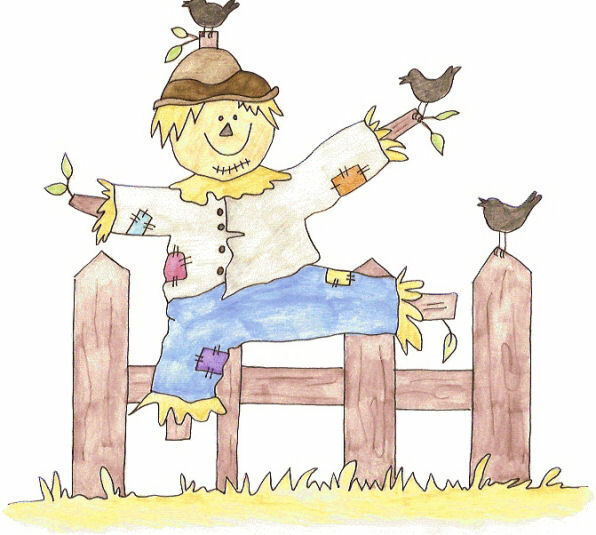 Barclay, the scarecrow, hung on a wooden pole in the middle of a field of barley. His hat, brown and bent, lay atop his hay-stuffed head. His pants, full of patched holes, hung limp and baggy. Mrs. McKenzie had sewn eyes, a nose and a mouth on the burlap bag face. The problem Barclay had - crows were not afraid of him. You see, Mrs. McKenzie had given Barclay a big grin and he looked too kind to be frightening. Dozens of crows flew around him, pecking at the grains of barley and shouting, "Caw! Caw! Caw!" One morning Crawford Crow landed on the fence post and looked up at the scarecrow. "Say, Barclay, you're not a very good scarecrow, are you? Why don't you try making noises? You can roar like a lion. If you do that the next time a crow lands, that should scare them away." Barclay said, "I'll try it. Mr. McKenzie's not very happy with them eating all of his barley." Crawford said, "Very good," and flew away. Later that day when the crows came back, Barclay roared like a lion. He roared so loud that he scared himself, but he didn't scare the crows away. Crawford flew back to the fence. "It didn't work?" He saw the crows pecking at the barley. Barclay shook his head from side to side. "No." "The next time you need to roar like ten lions." Crawford cawed and flew away. The next morning when the crows came back, Barclay took a deep breath and roared so loud that it shook the apples off the trees growing in the nearby orchard. All of the crows looked at Barclay with great fear and flew away. "That's much better. No more crows." The day passed and not one crow returned, not even Crawford. The day after that no crows came. By the third day Barclay began to feel a little lonely. By the fourth day the scarecrow felt sad. He didn't like being by himself in the middle of the huge field. He wanted the crows to come back. When the sun rose over the horizon, Barclay let the morning light warm his face and then he cawed as loud as a scarecrow could caw. He cawed and he cawed and he cawed. A flock of crows flew overhead. They heard Barclay and landed on the fence. They were afraid at first, but after Barclay did another caw the crows flew into the barley field and nibbled away. Soon all the crows that flew over the field stopped by for a nibble. Barclay looked around and saw them. Crawford flew down to the fence post. "Why didn't you roar like a lion?" "I don't want to be alone. I like having the crows around." With that, Crawford flew into the barley and nibbled away. As for Barclay, he was happy and never felt lonely again.